On this week's episode of "The Local Sports Lunchbox" on WPKZ, a pair of SuiteSports reporters called in to discuss the biggest Central Mass high school games of the week. First, our Connor Evans phones in to break down Grafton's thrilling triple-overtime win over Dover-Sherborn, and look ahead to the Indians' Division 3 state final against Ipswich. What to expect from that game, including Connor's "X-factor" player for Saturday. 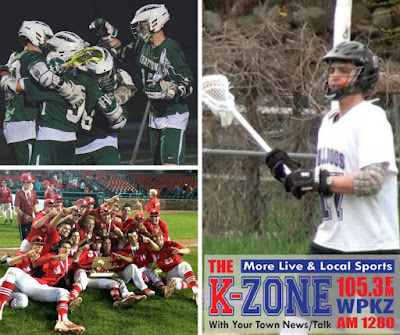 Then, former Monty Tech lacrosse coach Jonathan Shea joined us to talk about building a lacrosse program at a Voke school, with all the unique challenges presented there. Which players helped him guide Monty Tech to back-to-back state tournament appearances, and the program's first playoff win this season. Plus, coach Shea offers his thoughts on the state of Central Mass lacrosse in general. Finally, our Tom Joyce joins me to re-live St. John's (Shrewsbury)'s historic Super 8 baseball win against St. John's Prep. How did the Pioneers live up to their lofty pre-season expectations, and what was the mood after St. John's finally won the big one? You can hear all that, and much more, on this week's show below.